A great deal has been written about the activities of the so-called Latvian national communists in 1950s Soviet Latvia. 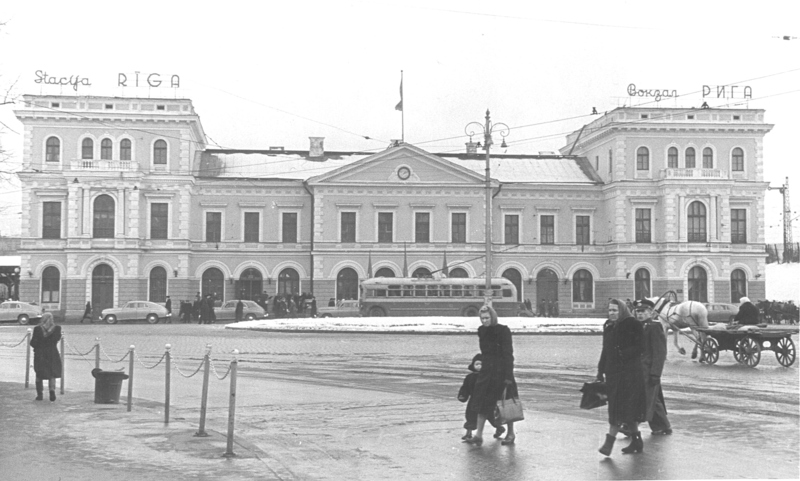 During the liberalising Thaw initiated by Soviet leader Nikita Khrushchev, the national communists challenged Moscow in order to obtain more autonomy in cultural and economic affairs for the Soviet Republics, enacting radical nationalist reforms that put Latvia on a collision course with hardliners in the Kremlin and ultimately resulted in their removal in a purge in 1959. In post-Soviet Latvia, the national communists are venerated for defending Latvia’s culture and language against Russification. So, who exactly were these national communists and how did they form a faction within the ruling Latvian Communist Party that presented the greatest challenge to Soviet Centre-periphery relations in the post-war era? The odyssey of the so-called Latvian national communists began with the friendships forged during the Second World War between Eduards Berklavs, Vilis Krūmiņš and Pauls Dzērve. After the Soviet annexation of Latvia in June 1940, these idealistic young communists volunteered to serve in the Red Army’s 201st Latvian Rifle Division. During the war, they distinguished themselves. In 1941, Berklavs was awarded the Order of the Red Banner for his part in the defence of Moscow at the Battle of Naro–Fominsk. In their memoirs, former national communists often refer to each other as ‘frontnieki’, literally frontline fighters, due to the camaraderie they forged during their service in the Red Army. These friendships were to bind the national communists into a tightly knit faction. After the war, Berklavs was appointed First Secretary of Latvia’s Komsomol (the Soviet youth organisation) aged 31. He was permitted to appoint other Komsomol leaders and requested the demobilisation of Krūmiņš and Dzērve. Krūmiņš then followed Berklavs’s rapid ascent up the Party ladder with a stint as Komsomol First Secretary between 1948 and 1951. Many of those Berklavs and Krūmiņš established contact with in the Komsomol in the late 1940s and early 1950s later became senior national communists. Indriķis Pinksis, Berklavs’s predecessor as Komsomol First Secretary and a wartime partisan leader, became Berklavs’s most loyal ally. Other prominent future national communists in the Komsomol leadership during this time included Pavel Cherkovskii (Deputy Minister of Culture 1958-1959), Vladislavs Ruskulis (Komsomol First Secretary, 1958-1959) and Vilis Samsons (Education Minister, 1950-1960). When the national communists were finally purged in 1959, ten former Komsomol secretaries were sacked, demonstrating the Komsomol’s role as the crucible in the national communists’ formation. An analysis of the careers and backgrounds of the national communists reveals a complex web of correlations and connections. Many were young, committed, ‘true believing’ communists who worked in the Communist Party underground in Latvia during Kārlis Ulmanis’s dictatorship between 1934 and 1940, which clamped down on opposition. Important national communist figures such as Arnolds Deglavs (Riga City Executive Committee Deputy Chairman, 1958-1960), Voldemārs Kalpiņš (Minister of Culture, 1958-1961) and Kārlis Ozoliņš (Chairman of the Presidium of the Supreme Soviet, 1952-1959) all met in a Latvian prison in 1935. Furthermore, Kalpiņš and Aleksandr Nikonov (Agriculture Minister, 1952-1960) were wartime comrades, as were Eduards Liberts (Transport Minister, 1951-1961) and Visvaldis Vallis (Deputy Agriculture Minister, 1958-1959). There was an element of unity, through the national communists’ shared experience in the communist underground, military service and the Komsomol leadership in the early post-war years. Latvia’s leaders felt the tension inherent in their dual roles as Party leaders and representatives of their nationality. There was a measure of independent legitimacy surrounding the new Latvian leadership who rose through the ranks during the Sovietisation of Latvia because they had lived in interwar Latvia, worked in the underground, and fought as partisans or in the Red Army against the Germans. This indigenous background gave these former underground activists and veterans’ significant political capital but left them susceptible to the mood of the local population. Consequently, it was natural that native Latvian leaders pushed against the limits of permissible behaviour after Stalin’s death. This translated into articulating certain national interests even in the face of opposition from Russians sent from Moscow. During the political turmoil following Stalin’s death in 1953, the networks of former Komsomol and ‘frontnieki’ began to coalesce into a group to demand switching to the Latvian language in Party work and the promotion of local Latvian cadres to leading positions in the Party and State hierarchies. The national communists remained acutely aware of their dual roles as the face of the Communist Party and representatives of ethnic Latvians. Therefore, their intellectual potential and understanding of conditions in Latvia seriously threatened the conservative old guard and partially caused the factional dispute that broke out between the orthodox communists and the emerging national communist wing of the Party in 1956. One myth is that the national communists were a homogenous Latvian group. Instead, they were a diverse collection of like-minded individuals from a range of backgrounds, ethnicities and ages. Despite the sectarian nature of Latvian politics in the mid-late 1950s, it is worth noting that Russian politicians were not automatically members of the ‘loyalist’ faction grouped around Stalinist and Russophile Arvīds Pelše, nor vice versa for Latvians. Though Latvians comprised an overwhelmingly majority of the faction, there were exceptions. Aleksandr Nikonov, born in the Pskov region on the Latvian border was the senior Russian national communist. Aleksandrs Straujums’s personnel file (Riga City Committee First Secretary, 1958-1960) lists him as a Russian. Belarusian Pavel Cherkovskii was born on the Latvian side of the Belarusian-Latvian border. Others were ethnic Latvians who were born outside Latvia, or even outside Imperial Russia. While this did not affect their nationality, it suggests they spent their formative years outside their ethnic homeland. Zvaigzne (Star) magazine editor Rafael Blūms was a Jew born in the Baden-Württemburg region of Imperial Germany. Deputy Chairman of the Economics Institute Benjamiņš Treijs was born in Samara province, Kalpiņš in Smolensk, Riga City Committee Department Head Albert Tseplis in Yaroslavl and Council of Ministers Secretary Arnolds Zandmanis in Bashkiria. Moreover, Latvians who spent the interwar period in the USSR were not necessarily Russified Latvians and precluded from membership. Agricultural Secretary Nikolai Bissenieks, one of the most prominent national communists, spent 15 of the interwar years living in Turkmenia between 1933 and 1947 and before that as Komsomol First Secretary in Komsomolsk-on-Amur in the Soviet Far East. Among the national communists were also representatives of the younger generation who began their careers in Soviet Latvia such as Riga Education Department Head Jānis Ģibeitis and Riga’s 49th High School Director Milda Vernere. Historians often claim that the conflict within the Latvian leadership was a generational dispute between a gerontocracy unwilling to yield power to a rising young cadre of technocrats. Yet the generational divide was actually very small. The average age of the national communists in 1959 was 46.7 years old, slightly older than they are often perceived to be. Pelše’s acolytes were on average only three years older than the national communists and hardly an elderly old guard. If ethnicity, age, place of birth and residency are insufficient explanations, on the surface, the common denominator seems to be that all the national communists could speak Latvian. Yet, there are even exceptions in this case. Bissenieks struggled with learning Latvian upon his return to Latvia from Turkmenia. A crucial aspect of the glue that held the national communists together was their shared embrace of Latvian culture and traditions. The national communists stood in contrast to the Russified Latvians who wanted to supplant Latvia’s culture with an internationalist Soviet culture. The pervasive influence of Russian culture upon Soviet cultural development made it especially difficult for the Latvian population to accept the replacement of their culture with one so distinctly Russian without a concomitant sense of colonisation. The national communists exploited this in their competition with the loyalists for popular support. The national communists operated as a distinct faction within the leadership. They were a cogent bloc of allied politicians with identifiable members, leadership and aims, such as safeguarding the Latvian population as a majority within the republic, promoting Latvian traditions and culture, preserving the primacy of the Latvian language, and prioritising Latvians for scarce resources such as housing. We can see that the national communists functioned as a faction within the leadership through how they convened, discussed and plotted to expand their influence. Decisions about many important issues took place during breaks between meetings, over ‘a cup of tea’ without an exchange of views among the wider bureau, the highest decision-making body in Latvia, which was dominated by the national communists from 1958. The national communists would effectively bypass their non-members on the bureau, make a decision about an issue at a break in the proceedings, and then one of them would propose their decision and the others would vote for it. Many issues were resolved in coordinated so-called ‘working discussions’ that excluded all bureau members except the national communists who would make a decision collectively. For example, Berklavs once proposed a surprise ministerial appointment without any information so his opponents could not express their opinions. In another instance, during a discussion on the question of Russian language streams in schools in June 1959, the national communists declared that further debate on the subject at the bureau was unnecessary because it would be resolved at one of their regular discussions. The national communists used these private discussions to protect each other. After one ‘tea break’ in April 1959, Krūmiņš suggested that the bureau discuss problems related to an ideologically questionable article published by Berklavs. The ensuing resolution was toothless and merely a slap on the wrist. Similarly, when an inspector from Moscow seriously criticised the shortcomings of the Latvian intelligentsia, following a ‘consultation’ the national communists proposed sacking the inspector. Another example from January 1958 further demonstrates the workings of a coordinated and determined faction within the leadership that presented a platform to the Party and lobbied for support. The national communists organised a successful and covert campaign for Central Committee members’ votes to prevent the re-election of the ethnically Russian Second Secretary Filipp Kashnikov. After the purge of the national communists, an investigation sanctioned in 1960 found that national communist leaders met before the opening of the 15th Latvian Communist Party Congress at the apartment of Jānis Kacens (a national communist) to galvanise support for the vote against Kashnikov. At Kacens’s apartment, national communists including Pinksis, Edgars Mūkins (Gosplan Deputy Chairman), Favišs Frīdmans and Anton Luriņš (CC Agricultural Department Head) gathered to discuss their strategy and to persuade some District Secretaries in attendance to vote against Kashnikov’s reappointment. The national communists are often portrayed as an uncoordinated group because of their informal status. Yet, how else could they operate but informally? This was necessary because it was impermissible for factions to operate openly within the Soviet Communist Party. With factionalism closely monitored, the façade of unity was maintained at all times. Despite its informal appearance, a leadership structure within the national communists is discernable. Berklavs is acknowledged as the undisputed leader of the national communists with the group sometimes referred to by the sobriquet ‘Berklavieši’ (‘Berklavists’). More than any other person Berklavs was synonymous with Latvian national communism, even referring to the group’s work in his memoirs as ‘Berklavism’. This is characteristic of Berklavs, whose actions fed accusations that he was arrogant and haughty. His frequent contributions to Rīgas Balss (Voice of Riga), the national communists’ newspaper, made him a household name and the face of the national communists. It also led to criticism that he was creating his own cult of personality. Berklavs’s critics noted that he acquired an ‘aura of fame’ and became a sort of idol. Rīgas Balss followed Berklavs’s every step and carefully described his activities. In newsreels, on television and on podiums, people saw Berklavs. National communist Vēra Kacena (the wife of prominent national communist Voldemārs Kalpiņš) wrote in Rigas Balss on 1st March 1958 that Berklavs had ‘such great talent, that he could accomplish any task without exception’. While it is unlikely that Berklavs actively cultivated a personality cult, Berklavs’s attitude and abrasive manner created much enmity among friend and foe alike. Arnolds Zandmanis, a national communist and the Council of Ministers Secretary for Cadres, described Berklavs as having an ‘excessive sense of righteousness a tendency to administer’. These personality traits did not affect Berklavs’s ability to rise prominently within the Party leadership, outside the national communist group’s structure. In 1954, aged just forty, he became a Council of Ministers Deputy Chairman, in December 1955 he was elevated to First Secretary of the Riga City Party Committee, a position akin to city mayor, and in January 1956 he joined the Latvian Communist Party Central Committee bureau, the highest executive organ in the Republic. Despite being promoted to the bureau relatively late, he offered the leadership, direction and personification needed to galvanise the national communists and engineer the promotion of his acolytes. Berklavs’s senior national communists were sometimes in unorthodox positions within the Party and state hierarchies. Vilis Krūmiņš was the highest ranked as Second Secretary (1953-1956 and 1958-1960). Pauls Dzēve is listed as a leading national communist, especially by his enemies because of his role as the architect of the faction’s economic plans and the national communists’ ideologue. Yet, outside the national communists, Dzērve held more humble status, he was never a bureau member and only became Economics Institute Chairman in 1958. Indriķis Pinksis was the fourth senior national communist. He had early connections with the others though he did not reach the bureau until 1958 (as a candidate) in the relatively unimportant position of Trade Union Council Chairman. Outside these four men, the literature differs on the remaining senior members. As Chairman of the Presidium of the Supreme Soviet (nominally the Head of State), Kārlis Ozoliņš is often included as a leading member. Another was Nikolai Bissenieks as Secretary for Agriculture along with his counterpart, Agriculture Minister Aleksandr Nikonov. Both held bureau seats and were prominent national communists not least because the faction identified agriculture as an area requiring major reform. Pavel Pizāns, editor of the main Latvian daily newspaper Cīņa (Struggle), and Gosplan Deputy Chairman Edgars Mūkins are sometimes included as leading national communists though only Pizāns held bureau candidate membership. Interestingly, many middle-ranking members held superior positions within the Party and state hierarchies to those commonly cited as leading national communists. In 1958, Berklavs was forced to become a Council of Ministers Deputy Chairman, a demotion from Riga City Committee First Secretary. His chosen successor, the 40-year old Aleksandrs Straujums effectively held the fourth most powerful position in the Republic and gained bureau candidate membership, but is considered part of the intermediate level of national communists. Minister of Culture Voldemārs Kalpiņš was a member of this layer, and along with his Deputy, Pavel Cherkovskii, they became prominent national communists because of the leading role they played in directing the resurgence of Latvian culture between 1957 and 1959. Many others have been linked with the national communists but held lower positions in the hierarchy, often as a Central Committee department head or deputy, obscuring their clandestine seniority among the national communists. Yet, these were key positions because they provided representation for the national communists and allowed senior members placed within the bureau to effect significant change, which was implemented with less bureaucratic resistance in the various departments, ministries and regional offices they controlled. In all, judging by the numbers purged in Latvia between 1959 and 1962, there may have been up to 2,000 rank-and-file national communists within the Latvian Communist Party and government. The term ‘national communism’ is oxymoronic. By its very nature, communism is incompatible with national aspirations because of its basic tenets, the socialisation of the means of production and the Communist Party’s dominance. The conditioning of communism and its limitation by national considerations is the antithesis of classical Marxism. National communism means an ‘independent road to socialism’ in contrast to the orthodox Soviet-style socialism dictated by Moscow. By implying there were other paths to communism, it was a rejection of the Kremlin’s own strategic imperatives. These other socialist paths during the construction of communism should account for the individual characteristics and conditions of each Republic in which they are attempted, hence the ‘national’ element. National communism cannot be called ‘National Socialism’ because that term is already taken. The national communists were communists according to their interpretation. The national communists did not refer to Marxism. Their relationship with Marxism was filtered through Leninism because Lenin, not Marx, was the primary ideologue of the Communist Party. They saw themselves as Leninists, cherry-picking the Leninist doctrine they wanted: the Lenin who espoused decentralisation and autonomy within the framework of Soviet socialism. Finally, this begs the question of whether the national communists were really Soviet communists. Berklavs’s personal beliefs make for an interesting case. In his memoirs, entitled ‘To Know and Not to Forget’ (Zināt un neaizmirst), Berklavs claimed he had a reputation in Moscow as a troublemaker following the national communists’ successful campaign to oust the Russian Second Secretary Fillip Kashnikov. Berklavs stated that Moscow and the Latvian Stalinists would never tolerate his elevation to Second Secretary, therefore he proposed Krūmiņš as the compromise candidate. Berklavs attempted to portray himself in his memoirs as an uncompromising maverick. While he espoused this attitude in the post-Soviet period, and perhaps even believed it when he looked in the mirror, it is unconvincing. This self-portrait of Berklavs suited his interpretation of his own dismissal in 1959 and in the post-Soviet period helped him distance himself from allegations of collaboration. Berklavs recounts his first doubts about the Party following his first visit to Moscow in autumn 1940, shortly after Latvia’s annexation. Blundering through a speech in pidgin-Russian to stormy applause from an uncomprehending audience, he then saw a fleet of Kremlin limousines and contrasted it with the war-torn, exhausted Soviet countryside he viewed out of the train window on the way back to Latvia. Caught between the advancing Germans and hostile Latvians, it makes logical sense that Berklavs remained in the Party and volunteered for service in the Red Army. Retrospectively, Berklavs claimed that he was only a loyal communist until 1954 and that after that period he ‘did everything possible against Communist Party goals’. So, why did he remain in the Party after 1954, after ‘losing faith’? Berklavs claims that having come to view the Soviet Union as a form of Russian imperialism, but realising the futility of joining the armed resistance or resigning from the Party because it meant deportation to a labour camp, he chose to work from within the Party to slow down Russification and the flood of settlers. To achieve this he set about forming a group with like-minded colleagues and ensuring their promotion. Despite his controversial policies, Berklavs exaggerated his rebelliousness. At a bureau meeting, Latvian First Secretary Jānis Kalnbērziņš revealed that Berklavs was marked to join the Central Committee apparatus in the Soviet capital in the future. He was also permitted to holiday in East Germany in 1957, which demonstrates that the authorities had a high degree of confidence in him. Furthermore, the ailing Vilis Lācis designated his deputy Berklavs as heir apparent for the post of Council of Ministers Chairman. This suggests that, contrary to Berklavs’s assertions, his foray into national communism had not damaged his reputation and the Soviet upper echelons regarded him highly until early 1959. In February 1959, Berklavs published an unauthorised and extraordinary article entitled ‘Conversation from the Heart’ in the Party’s main Latvian and Russian language newspapers. Berklavs recognised that the Party controlled decision-making. Therefore, he made a desperate plea for Latvians to join the Party. Yet, this is a strange move for someone hostile to the Party even if he thought he could take the Party over by undermining Moscow’s control through packing the Party with ethnic Latvian supporters. Following the purge in July 1959, Berklavs was exiled to Vladimir. After returning to Latvia in 1968, he became a dissident, beginning work on a subversive publication entitled ‘Letter of 17 Latvian communists’ almost immediately. Yet, even this was confusing given the title. The letter proclaimed in no uncertain terms the political affiliation of its authors: ‘We are not opportunists, nor are we “leftists” or “rightists”. We are Communists, and most of us have been such for 25-35 years and more. We wish only well to socialism, Marxism-Leninism, and mankind’. This letter attacked the Russification of Latvia and was smuggled out of the Soviet Union for publication in the West in 1972. The letter’s publication embarrassed Soviet authorities. Consequently, Berklavs was repeatedly interrogated by the KGB and was expelled from the Party in 1974. As the Soviet Union collapsed, in the late 1980s Berklavs (along with other former national communists such as Krūmiņš and Kalpiņš) had a ‘political rebirth’ becoming a Popular Front Deputy in the Latvian parliament and a founder of a radical nationalist party. Did Berklavs really experience a political metamorphosis; was he a nationalist all along, or merely a fickle opportunist? Berklavs’s evolution was inconsistent and his memoirs highlight this. In the 1940s, he was for Soviet socialism, in the 1950s, it was national communism, and in the 1980s, it was pure nationalism. LVA-PA f.101, apr.22, l.15, lp.21. Stenograph of the Plenum of the Latvian Communist Party, 7th-8th July 1959. LVA-PA f.101, apr.22, l.48a, lp.199. Special File. Stenograph of meetings of the Latvian Communist Party Central Committee bureau, 20th-21st June 1959. LVA-PA f.101, apr.22, l.48a, lp.199-200. LVA-PA f.101, apr.23, l.10, lp.81. Stenograph of the Plenum of the Latvian Communist Party, 26th-27th April 1960. ‘Iz arkhivnykh fondov: Stenogramma 7-ia zakrytogo Plenuma TsK KPL 7-ia-8-ia iiulia 1959’, Kommunist Sovetskoi Latvii, 5 (1989), pp.88-89. Eduards Berklavs, ‘Visiem, kam ir interese par mani’, Montreālas Latviešu Biedrības Ziņotājs, 1st July 1993, p.16. Walter Kemp, Nationalism and Communism in Eastern Europe and the Soviet Union: A Basic Contradiction?, (Basingstoke: Macmillan, 1999), p.127. Bleiere et al, History of Latvia, p.393. Berklavs, Zināt un neaizmirst, p.110. William Prigge, Bearslayers: The rise and fall of the Latvian national communists, (New York: Peter Lang, 2015), p.24. Berklavs, Visiem, kam ir interese, p.16. LVA-PA f.101, apr.22, l.48a, lp.102. Berklavs, Zīnat un neaizmirst, p.93. Egīls Zirnis, ‘Latviskā sociālisma gals’, Diena, 5th July 2009. Vilis Krūmiņš, ‘Laika pakāpienus skaitot’, Padomju Jaunatne, 3rd November 1988, p. 2. Eduards Berklavs, Zināt un Neaizmirst, (Ebook: Eraksti, 2011), p.59. Indriķis Pinksis, Interview with Jānis Lapsa, ‘Tas drūmais piecdesmit devītais’, Karogs, 10 (1988), p.126. Voldemārs Kalpiņš, Interview with Jānis Lapsa, ‘Pirms drūmā piecdesmit devītā’, Karogs, 11 (1988), p.113. Daina Bleiere, ‘Nacionālkomunisms Latvijā: Historiogrāfija’, Latvijas Vēstures Institūta Žurnāls, 46 (2003), pp.84-85; Jeremy Smith, ‘Leadership and Nationalism in the Soviet Republics 1951-1959’, in Jeremy Smith and Melanie Ilic (eds.) Khrushchev in the Kremlin: Policy and government in the Soviet Union: 1953-1964, (Oxford: Routledge/BASEES, 2011), pp.79, 85. Ilga Apine, ‘Vai Latvijā arī bija nacionālkomunisti?’, Neatkarīgā Cīņa, 6th October 1993, p.4. Latvian State Archives – Party Archives (Latvijas Valsts arhīvs – Partija arhīvs), fonds 15500, apraksts 2, lieta 5432 – hereafter LVA-PA f.15500, apr.2, l.5432. Aleksandrs Ivanovich Straujums’s personnel file. LVA-PA f.15500, apr.2, l.80. Nikolai Bissenieks’s personal file. Daina Bleiere, Ilgvars Butulis, Inesis Feldmanis, Aivars Stranga, and Antonijs Zunda (eds. ), History of Latvia: The 20th Century, (Riga: Jumava, 2006), p.396. William Prigge, ‘The Latvian purges of 1959: A revision study’, Journal of Baltic Studies, 35 (2004), pp.218-19, 222. Dr. Michael Loader is a Postdoctoral Research Fellow at the International Centre for the History and Sociology of World War II and its Consequences at the Higher School of Economics in Moscow. He received his PhD in November 2015 from King’s College London with a dissertation entitled ‘The Thaw in Soviet Latvia: National Politics 1953-1959’. He is the recipient of the Association for the Advancement of Baltic Studies’ 2017-2018 Emerging Scholar award. His current research includes projects about Soviet patronage and power relationships and the career of Politburo member Arvīds Pelše, and the changing relationship between Moscow and the Soviet periphery between 1944 and 1964.